Quick overview In this updated Very Short Introduction to British Politics, Tony Wright adds a wealth of new information to highlight the important changes affecting the British political system; including the impact of the fall of New Labour and the rise of the coalition government, the financial crisis, parliamentary scandal, terrorism, and immigration. 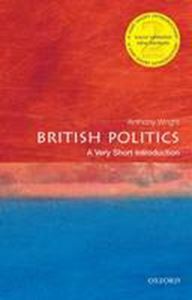 Tony Wright's Very Short Introduction to British Politics is an interpretative essay on the British political system, rather than an abbreviated textbook on how it currently works. He identifies key characteristics and ideas of the British tradition, and investigates what makes British politics distinctive, while emphasizing throughout how these characteristics are reflected in the way the political system functions. Each chapter is organized around a key theme, such as the constitution or political accountability, which is first established and then explored with examples and illustrations. In this new edition Wright considers how the system has recently changed and continues to do so, in light of the coalition government and the fall of New Labour, as well as the impact of the financial crisis and issues such as terrorism and immigration. ABOUT THE SERIES: The Very Short Introductions series from Oxford University Press contains hundreds of titles in almost every subject area. These pocket-sized books are the perfect way to get ahead in a new subject quickly.